No Fenders -Formula 1, IndyCar and A Whole lot more..: As The IndyCar World turns, remaining Diehard Fans look set to Sit upon their Hands thru another "Transition Year"
As The IndyCar World turns, remaining Diehard Fans look set to Sit upon their Hands thru another "Transition Year"
So many thought bubbles, so little time... As just before I left for the B-I-G' ISLAND, nee Kona, Hawaii early January, I mused to myself how much Indy Cars has simply MARGINALIZED ITSELF! Started off the year somewhat in disarray, as I still cannot believe I-T! With less than a week's time before leaving for Kona, ironically on my way to the grocery store and next door pharmacy for Hawaiian Punch; Err trip supplies, I somehow swept my white cane off of the "lumpy" sidewalk into an unseen ditch and sickly felt it go SNAP! Even though I hadn't put any significant pressure (weight) upon it; SHEISA! As I'd never done this before, and was simply in shock over it happening! And since it takes about 3hrs to simply go to the "Eye Store," 'N Back to Site Connection (Blind & Partially Sighted products supplier) I decided to use my back-up cane instead upon the B-I-G' ISLAND! And mused to myself upon swapping the month old plastic tip from said broken cane onto the back-up unit, which had a brand new 'Juan installed - I cheerily noted how I was now using a "Scuffed" cane tip, a la our IndyCar Boyz using scuffs during Qualie' and races; Hya! I also mused to myself how this first trip of the year vicariously made me feel like I'm preparing to get my "Kit" ready for the season and go off into the wild blue younder... Although I harbour NO illusions of being a bonified, honest-to-goodness REAL Journo, aka Journalist, like my favourite Scribes Joe Saward, 'Ol 'R, aka Robin Miller, thy 'Wee Willie Buxom (Will Buxton) 'Kurty Cavin, Marshall Pruett and Adam Cooper, not to mention the very capable Joe Berkemeier & Patrick Stefan of Trackside Online; Hmm? Perhaps I should login to my account one of these Dazes, eh? Although I typically just read Trackside Online during the horrendously SHORT IndyCar season, i.e. ; STUPENDOUSLY SHORT five months; URGH! But hey, that's Otay IndyCar's, we Pacific Northwesteners DON'T needs Yuhs! Although Seattle's still in mourning over the Super Bowl's DUMBEST PLAY CALL EVER! 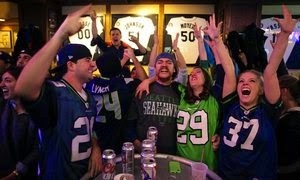 As Seattle, and more visibly, the feverish 12S' as the Fans are known here, held the city in a state 'O Seahawks Mania! As unintentionally, I tried going home Saturday morning via public transportation on Game Day, which equals B-I-G' MISTAKE! As it was the first round NFL Playoffs game vs. Carolina Panthers, and as Tacoma Bureau Chief Mary Ellen pulled up to the kerb to let me off at the "Aroma-dome," (Tacoma Dome) she noticed that the bus stop was filling up quickly with various 12S' adorned in their replica jerseys; Hmm? What time is the game? Wanna wait for the next bus instead, Tomaso? As this was "High Noon," and the bus situation was to only get WORSE! And this was five and one-quarter hours before kickoff; Holy Catfish! As there wasn't any seats on the busses and the bus island was just swelling 'N swelling with more fans seeking alternate transportation, since apparently the "Sounder" light rail trains were packed to capacity too! As Mary Ellen offered to drive me home, but I said are you crazy! As you'll just be going into the belly 'O The Beast both ways! Becoming gridlocked in Seattle's notoriously poorly congested Downtown Seattle Highway I-5 corridor! Thus, I elected to return to Tacoma instead, where the local grocery store's parking lot was jammed packed with shoppers stocking up before the B-I-G GAME; CRIKEYS! Then, a few Dazes later, my local grocery store Courtesy Clerk Cheryl, who assists me shopping told me the bizzaro story of her experience at a local Bar when she and her "Hubby" tried leaving just minutes prior to Halftime to go home and take care of their dog. As they got up to leave the Bar, another female patron enquired: "Are You Ok?" As apparently the lady was completely kerfuffled over how somebody could leave before the B-I-G' GAME WAS OVER; WTF? As Cheryl thought they'd be doing the standing room only crowd a favour! And thus, Y'all can S-E-E how Seattle's totally fine without IndyCar racing up here or the series being dormant for half of the year-plus! Thus it was pretty entertaining reading his Mark Miles New Year's Resolutions story a week or so after I'd scribbled my recently published post about 2014 being the year that IndyCar Blogging Died. Yet, I too, like George am NOT opining for the return of Randy "The CandyMann!" Bernard, but am compelled to roll out the barrel' Err, quote that epic 'Ronnie sound bite: "Are You better Off than You were 4yrs ago?" Like do we really wanna harken back to the 'TG Dazes, like When good 'Ol "Billybob razenheartz' (Brian Barnhart) was in charge of Race Control! The Mark Miles Sing-along Song! Since, for every step the Indy Car Series takes forward, it seemingly takes two steps back, having originally missed Brazil's announcement to cancel this year's season opening race outside North America in Brasilia due to that ever convenient financial difficulties buzzword. Although happily 'TK Follow-your-Schnoz Kanaan & Scott Dixon won this year's Rolex 24! While I totally missed the announcement of IMS going on the CHEAP again! By dumping Pippa Mann for Davey Hamilton, as this year's Sidekick; Err colour commentator alongside Paul Page on the IMS Radio Network Broadcasts, as Davey's just way too laid back for Mwah! And while I'm looking forward to the muted turbocharged roar of Indy Cars in another 469 Days; Err March 27-29 at St Petersburg, Florida, which I beg to differ with uze Mr. Oil Pressure, but I think this will now officially be the LONGEST Off-season ever, right? As August 30, 2014 to March 29, 2015 = 210 FREAKIN' DAYS WITH NO RACING! By my count! Ditto, a horrendous seven months layoff! Hence, it's really, really hard to fathom how IndyCar will ever get its Mojo back and become relevant to Americre's Mainstream "Stick 'N Ball" or Seattle's legendous' "Legion 'O Boom!" Since after all the only racing that resonates in America is 'RASSCAR; YUK! Which shortly "Peacock-lite" (NBCSN) will be craming down our gullets ad-nausea 24/7 about their upcoming inaugural season!